After an amazing time in Mildura, we were off to Swan Hill. And how do you get from Mildura to Swan Hill, I hear you ask? Well, by stretch limo of course. The lovely Vince and Miranda Lamattina (Mildura Limousines) were at our service from this point onwards until we got to the airport safely to return to Melbourne. We loved their friendly and warm nature. They were both keen to join us and get actively involved on our adventures, visiting every one of the various venues and pit stops together with us. The mighty Murray River has long been a lifeline feeding a diverse range of farming and agribusiness pursuits across the southern Australian states of Victoria, New South Wales and South Australia. 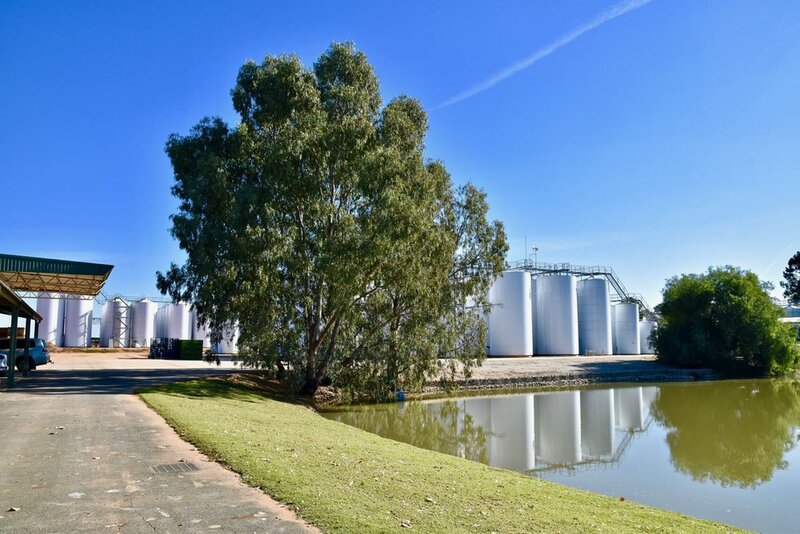 Andrew Peace Wines is situated at Piangil, on the banks of this majestic river. Its range of value for money wines for export and domestic markets displays all of the bold, rich characteristics of the riverbank it calls home. We loved tasting our way through the wines. Particularly memorable was the new "cafe de Cabernet" a bold cabernet sauvignon infused with Colombian coffee beans - It's a cracker! 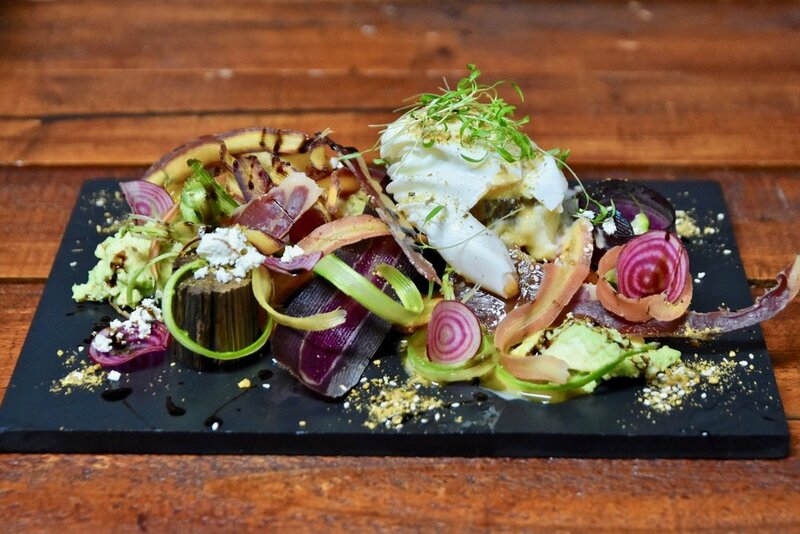 Positioned between the award winning Pioneer Settlement and the Swan Hill Regional Art Gallery, Spoons Riverside offers diners the opportunity to enjoy local, seasonal produce from the surrounding Murray-Mallee region, cooked with love. 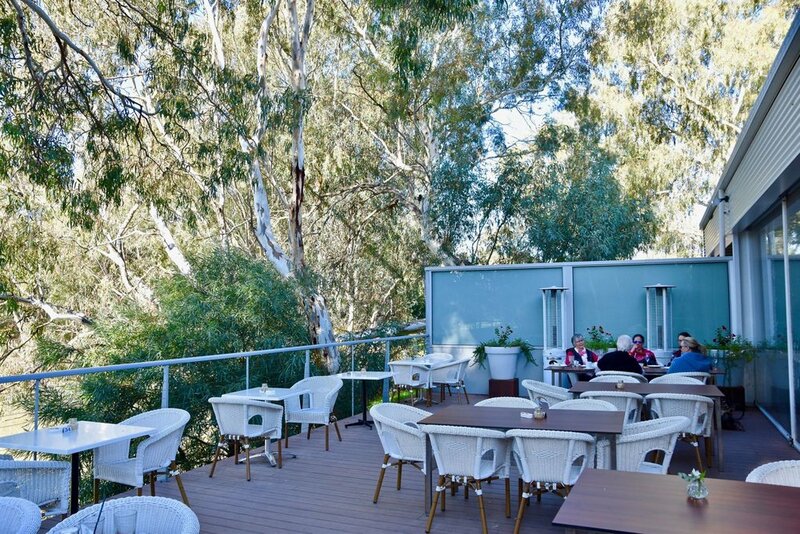 The best spot to dine is on the decking, under the magnificent River Red Gums, where you can enjoy the restaurant's distinctly Australian appeal while relaxing to the gentle tempo of the passing river water. 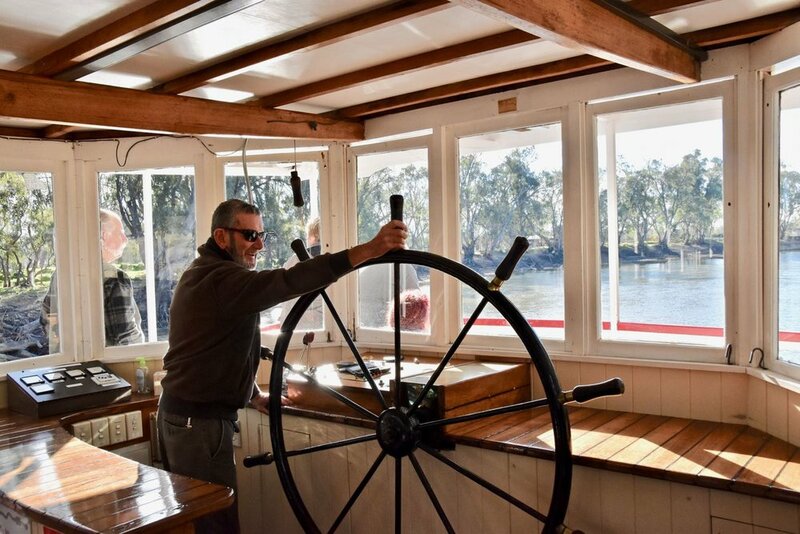 No visit to Swan Hill is complete without a cruise aboard the PS Pyap as it winds its way along the mighty river. The hour-long cruise departs from the wharf at the Pioneer Settlement and travels up river past the historic Murray Downs Homestead. It was thoroughly enjoyable kicking back and listening as the captain narrated the riverboat's history and the influence this form of transport had on early settlement along the river and details about the natural environment. A hop and a skip from the Wharf is the Pioneer Settlement. Brimming with nostalgia and situated near the picturesque banks of the Little Murray River, this place transports visitors back to the 1850s. Make sure you enjoy the horse and cart rides as well as the vintage car rides while you absorb the sights offered. Just 2 minutes from Swan Hill City Centre, Ibis Styles Resort has 62 comfortable rooms. The resort also has a range of facilities including indoor and outdoor pools, a games room, gym, mini golf and a half tennis court. 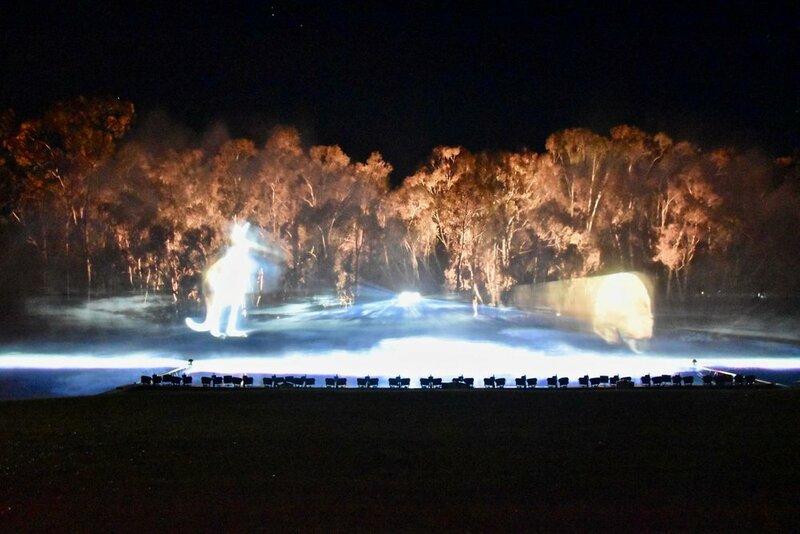 Using water, light, laser, sound and special effects to tell the story of the Murray, we were transported back 30 million years, before travelling forward through time to the Murray River as we know it today. We loved the use of the natural river environment and setting as the background. Java Spice Restaurant brings honest food values, focusing on locally sourced seasonal produce, all wrapped up in a tropical paradise setting that makes you feel like you are miles away. 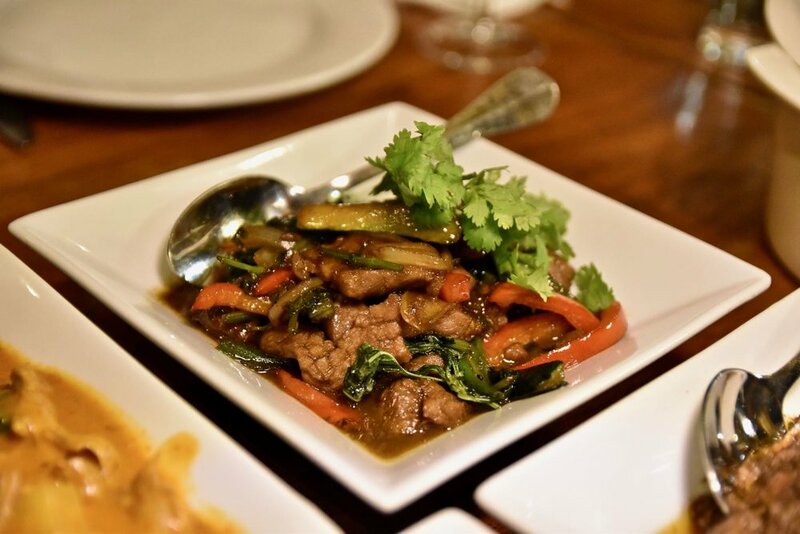 The authentic South East Asian menu focuses on Thai cuisine. Entrees of Deep fried chicken wings stuffed with chicken and prawn mince, as well as Balinese goat satay skewers barbequed and basted with Balinese spices were a hit. 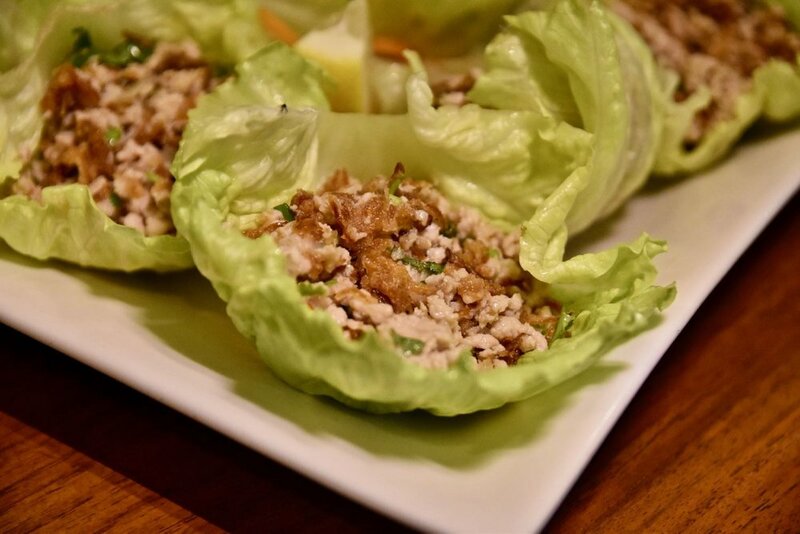 For something lighter, the Larb Gai on Letuce Leaf is beautiful. A wonderful mélange of bold and vibrant flavours. Larger share plates include tender, melt in your mouth Massaman Beef Curry and the absolute highlight of our visit, hearty Barramundi Penang Curry which boasts tender pieces of Barramundi fillet cooked in a delicious penang curry sauce with assorted vegetables, basil, fresh mint and some slithers of fresh chilli. This well-conceived dish was bursting with flavour and took full advantage of the barramundi’s most notable characteristic – its supple flesh. For dessert, do not go past the Kanom Tuy. Combining an addictive salinity and sweetness, this dessert comprises of beautifully moist and rich sticky Thai white rice cake served alongside luxurious coconut cream and a dollop of coconut ice cream. 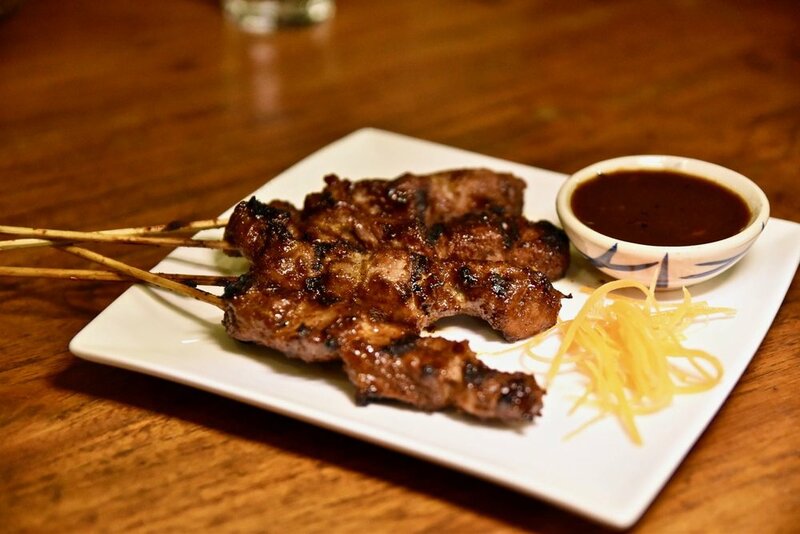 With a firm grasp on the fine art of balancing South East Asian flavours of salinity, sweetness, heat and acidity, Java Spice is a compelling proposition of beautiful and punchy food in the area. Swan Hill born and bred Chef Brett Wright (runner-up of SuniTAFE Chefs of the Future competition 2012) and his lovely mum, Sue are behind High Thyme, Swan Hill's most eclectic and loved café. The interior is creative and fun - inspired by form and materials that have caught Brett's eye. It's a quirky and artistic space which is best of all warm and intimate. The kitchen is in safe hands with Brett at the pass. The menu features a myriad of delicious and interesting brunch options to suit most. We loved tasting our way through the menu. The caramello banana porridge was an absolute highlight. 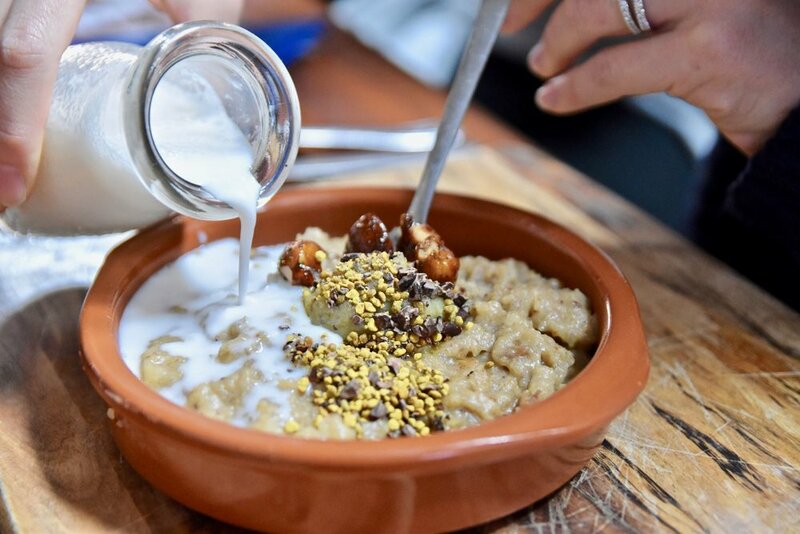 This luscious porridge is topped off with macadamia nut caramelised with Native Strawberry Gum and Elderflower and a little Bee Pollen with Butterscotch Chai just for that extra bit of indulgence. Sensational. Similarly delicious was High Thyme's take on the smashed avocado which features La Dolce Vita Artisan Bread, smashed avocado, crisp serrano and confit tomato served with house made aioli, dukkah, crispy spiced kale and perfectly poached egg encasing dripping egg yolk. It was heaven on a plate. For something heartier, do not go past the "Fire Chicken" - Think umami laden fried chicken served with red rice, kimchi, baked egg and cheese finished with sriracha sesame pearls. It's a work of art. 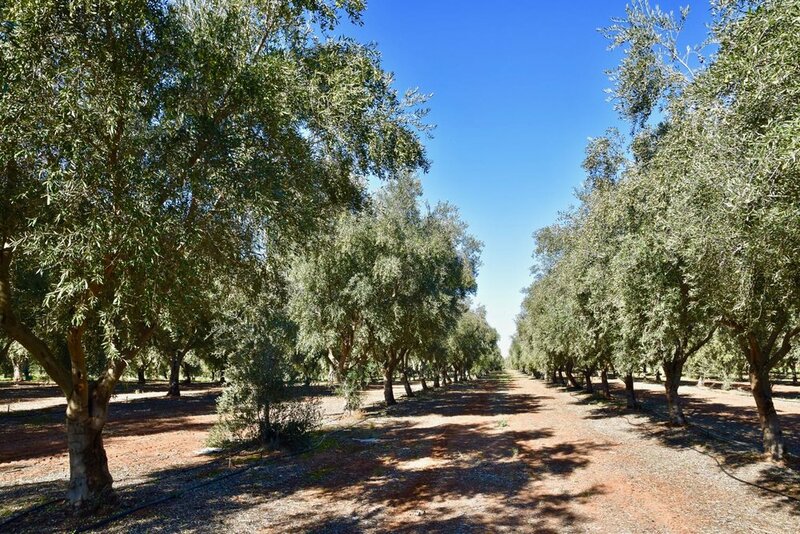 Robinvale Estate Olive Oil is Kim Natale’s labour of love. From a passion to create delicious foods and growing up among the olive trees, Kim developed an appreciation of food in its purest form. We were privileged to meet passionate Kim who took us through a delicious tasting of what the Estate has to offer. The Estate produces stunning dressings, jam, tapenade, dukkah, balsamic vinegar, flavoured olive oils, extra virgin olive oil and olives. The olives at the estate are picked and harvested at their optimum time. The dressings are made from the freshest citrus in the region. Olives are pressed with fruit onsite together with vinegar or verjuice, herbs and other premium ingredients to create gourmet dressings perfect to use in salads or as marinades. 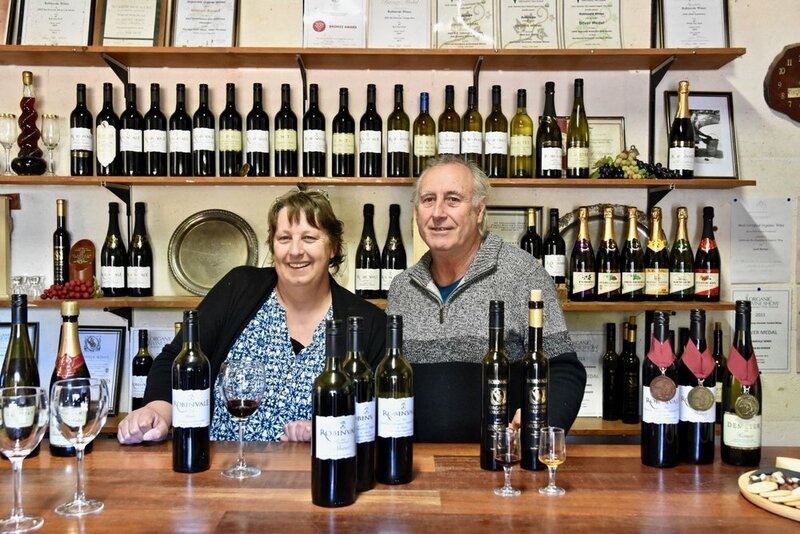 Not surprisingly Robinvale Estate's products win accolades nationally. We love how the care, precision and passion in the prepartion process truly shines through in the final product. We also sampled delicious granoata made lovingly by Kim under another business she owns, Liv & Luv Gourmet Foods. There is a granoata to suit everyone with the wide (and scrumptious) range which includes gluten free, paleo and high protein options. 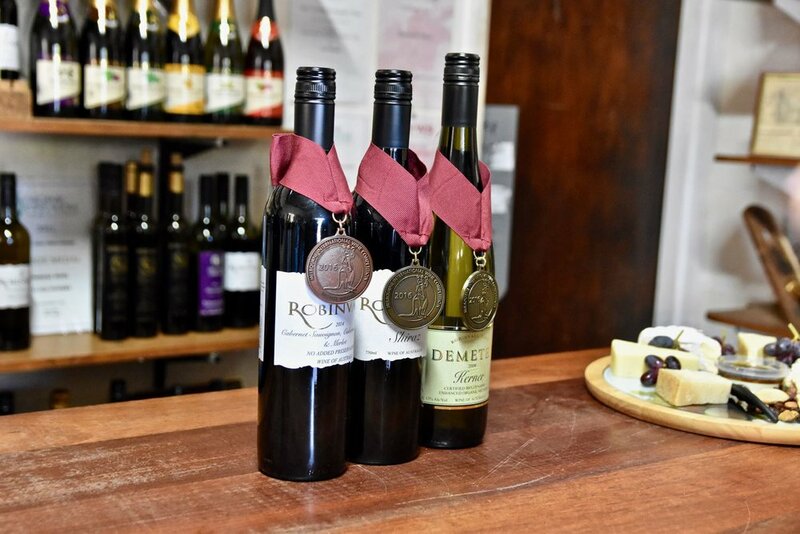 Robinvale Wines is an award-winning family run and owned Certified Organic and Bio-Dynamic winery and vineyard. One of the first Australian wineries to be fully accredited with the Bio-Dynamic Research Institute of Australia, today, the winery offers a variety of wines including Table, Sparkling and Fortified, Organic, Bio-Dynamic and Preservative Free Wines perfect for health and environmentally conscious consumers. Our favourite wines from the Estate include the 2008 Kerner. A cross between Riesling and Trollinger grapes, this is a wonderfully vibrant and fruity dry wine. We loved the crisp, clean acidity in the finish. Another top pick of ours is the 2008 cellar aged Shiraz. A rich, bold and complex dry red with tantalising oak. It's a stunner. Brimming with charm, Loft 13 is a welcoming café that exudes an air of tranquillity and is anything but a conventional neighbourhood joint. The dining area is furnished tastefully with wooden furnishings and scattered greenery fostering a feeling of warmth and cosiness. This is further reinforced by the friendly and courteous service. 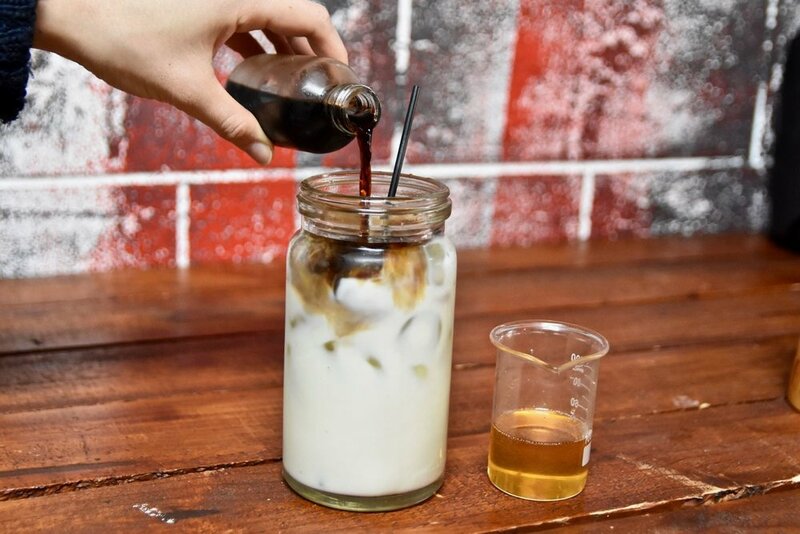 Designed by passionate owner Jessica Caminti, the menu is unconventional - keeping things interesting whilst ensuring that there is something for everyone. For health-fiends the salads are a great option paired with protein of your choice. If you're a burger person, look no further. You are in your element. We recommend the famous "Dirty Bird Burger" that will satiate with crispy chicken cutlet and creamy slaw. For sweet tooths, the array of cakes and pastries are sensational. These guys also offer a wonderful selection of raw desserts! As vegan as these sweets are, they are concocted without a single sacrifice to flavour. Everything we sampled was wonderful. The Murray is an inspiring destination for indulgent gourmet travellers. Rolling vineyards, farmers' markets, riverside picnics and food and wine trails are key ingredients in the character of the Murray. Whether you’re packing a picnic at a local market, visiting a farm gate or cellar door, or dining riverside in style, there’s a flavour to suit all tastes and budgets along the Murray.